When you think about the places investing in innovative renewable technologies, a tiny rural town in Northern Colorado is probably not the first place that comes to mind. But, that’s exactly what’s happened in Walden, Colorado. Last month, GRID Colorado completed construction of Colorado’s first floating solar array at the Town of Walden’s drinking water treatment facility. The town is located near Colorado’s northern Rocky Mountains. Only about 600 people call Walden home, 20 percent of whom are living below the poverty line. The floating system, where modules are mounted on pontoons and float atop the facility’s lagoon, was a great solution for the town to go solar because they didn’t own enough land to host an array. The 75 kW project, constructed using Jinko solar modules, will provide clean power to treat drinking water for the town as well as the local school district and Jackson County offices. See rest of story on the Grid Alternatives webpage. Denver’s Mayor, who is seeking a third term, has pledged the city will source 100% of its electricity from renewable sources by 2030. In doing so, Denver has become the 73rd city in the United States to commit to a 100% renewable electricity target; however, few have aimed to complete the transition so quickly. Nine other Colorado cities have made a renewable electricity 100% commitment, but of course Denver is the largest. The population of Denver is 693,060 (2016). Hopefully the entire Denver metro area with a population of 3,470,235 will follow the city’s lead. NV Energy has asked Nevada regulators to approve three new long-term power purchase agreements totaling 100 MW of solar capacity, including two which could yield historically low prices for its subsidiaries Nevada Power and Sierra Pacific Power. According to the utility, the Techren 3 and 4 solar projects, each proposed at 25 MW, would be the lowest-cost universal solar purchase agreements entered into in the United States. The levelized price of the new solar is $34.20/MWh for both 25-year contracts. The third project, the 50 MW Turquoise Nevada solar project, to be constructed in the Reno Technology Park in Washoe County, would utilize a 25-year power purchase agreement at a base price of $30.99/MWh that would escalate 2% annually, and is expected to be operational by the end of 2020. In its biggest year to date, the United States solar market nearly doubled its annual record, topping out at 14,626 megawatts of solar PV installed in 2016. This represents a 95 percent increase over the previous record of 7,493 megawatts installed in 2015. GTM Research and the Solar Energy Industries Association (SEIA) previewed this data in advance of their upcoming U.S. Solar Market Insight report, set to be released on March 9. For the first time ever, U.S. solar ranked as the No. 1 source of new electric generating capacity additions on an annual basis. In total, solar accounted for 39 percent of new capacity additions across all fuel types in 2016. Southwest Power Pool set a wind-penetration record of 52.1 percent at 4:30 a.m., Feb. 12, becoming the first regional transmission organization (RTO) in North America to serve more than 50 percent of its load at a given time with wind energy. The milestone beats a previous North American RTO record of 49.2 percent that SPP set April 24, 2016. Wind penetration is a measure of the amount of total load served by wind at a given time. The proliferation of wind power in the SPP region has grown significantly over the last decade. As recently as the early 2000s, SPP’s generating fleet included less than 400 MW of wind, and for years, wind was reported in the “Other” category in SPP’s fuel mix data. Wind is now the third most-prevalent fuel source in the SPP region. It made up approximately 15 percent of the organization’s generating capacity in 2016, behind only natural gas and coal. Installed wind-generation capacity increased in 2016 alone by more than 30 percent — up 4,000 MW from 12 GW to more than 16 GW. SPP’s maximum simultaneous wind generation peak rose from 9,948 MW in 2015 to 12,336 MW in early 2016. The successful deployment of wind and other renewables in SPP is made possible because of its geographic diversity and robust transmission system. The RTO’s footprint covers almost 550,000 square miles from the Canadian border in Montana and North Dakota in the north to parts of New Mexico, Texas and Louisiana in the south. SPP has approved the construction of more than 10 billion dollars in high-voltage transmission infrastructure over the last decade, with much of it being built in the Midwest to connect rural, isolated wind farms to population centers hundreds of miles away. MHI Vestas Offshore Wind has unveiled its new 9 megawatt wind turbine which, in testing at the company’s Østerild broke the energy generation record over a 24 hour period. The continued development of offshore wind turbines continues apace, with the unveiling of MHI Vestas Offshore Wind’s latest offering. The uprated V164 8 megawatt (MW) wind turbine has been reworked so that it is able to reach 9 MW “at specific site conditions,” said the company on Thursday. Further, the new 9 MW turbine smashed the energy generation record for a commercially available offshore wind turbine, producing 215,999.1 kilowatt-hours (kWh) over a 24 hour period. If you’re new to the wind turbine world, an increase of 1 MW per wind turbine is a much bigger story that it might appear at first glance. With each increase in turbine power, fewer turbines are needed to meet offshore wind farm target levels, which turns into financial savings for developers and consumers. This impacts the ‘levelized cost of electricity’ of offshore wind, which as we have seen over the past year has been dropping rapidly. In the UK, the levelized cost of offshore wind fell below £100 per megawatt-hour (MWh) four years in advance of the original target set by industry and Government. Meanwhile, in the rest of the European Union, offshore wind saw the lowest levelized cost price of ‎€49.9/MWh. The chief architect of President Barack Obama’s climate change policies has warned the incoming Trump administration that US law and the scientific evidence of global warming will constrain any attempt to overturn her work. Ms McCarthy said that, just as she had to provide a scientific foundation for her regulations to curb carbon dioxide emissions, the Trump administration would be required by the Clean Air Act to show that any attempt to tear up the regulations was scientifically justified. “If they choose [to] develop a different record then they have a right to do that, but it’s going to be a very high burden of proof for them, because I have no question that what we have done will be solid from a science perspective,” she said. Tack on the CPP (middle map), which would require coal plants to capture some of their carbon emissions, and coal (red) cedes more territory to wind and natural gas. 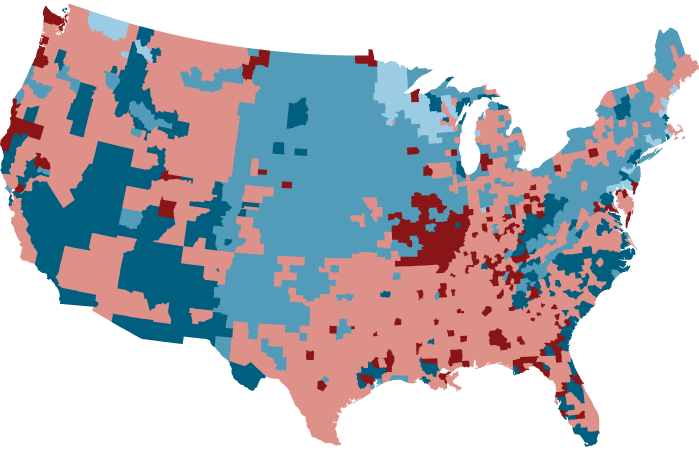 And coal disappears from the map if you add the environmental and public health costs associated with various energy sources (the third map), including a $62 per metric ton price on carbon dioxide emissions. And nuclear power (light blue) expands. Current–Coal only cost effective in a few scattered regions. The mammoth analysis suggests that “it might be that decarbonization [of the U.S. electrical grid] is able to be met even without the Clean Power Plan,” says Michael Webber, an engineer and deputy director of UT’s Energy Institute, which conducted the research. The work is part of a broader initiative at the institute, aimed at tallying all the costs that come with keeping the lights on, from environmental impacts to building transmission lines or responding to regulations. Snazzy online calculators and mapping tools that accompany the new model enable users to tweak a number of variables, including gas prices and environmental costs, and see how the nation’s energy future might change, at the level of individual counties. A new survey of 1,000 people conducted by the Republican polling firm Public Opinion Strategies illustrates this dynamic. According to the poll, 75 percent of Trump voters support “action to accelerate the deployment and use of clean energy” — including solar, wind, energy efficiency, and community renewable projects. This backs up what we already know. Renewables are generally not a partisan issue. Survey after survey demonstrates this fact. LANSING, MI — President-elect Donald Trump has vowed to end the “war on coal,” but DTE Energy CEO Gerry Anderson said the company plans to phase out the fuel, regardless. Anderson said the company had already shuttered three coal-fired units, and has plans to shelve another eight by 2030. “All of those retirements are going to happen regardless of what Trump may or may not do with the Clean Power Plan,” said Anderson in an interview. On the plains of West Texas, new wind farms can be built for just $22 a megawatt-hour. 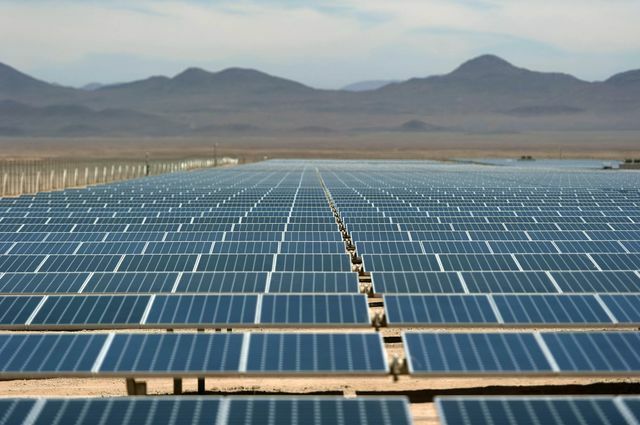 In the Arizona and Nevada deserts, solar projects are less than $40 a megawatt-hour. 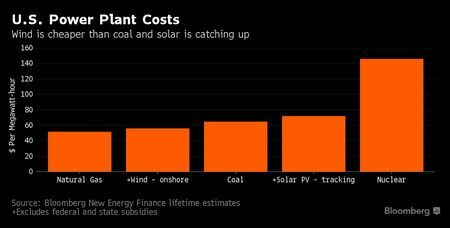 Compare those figures with the U.S. average lifetime cost of $52 for natural gas plants and about $65 for coal.